As I understand it, construction started about six years ago. Four sleek, contemporary high rises are just around the corner, and up the hill, from me. All I have to say is “Zorlu Center” and taxi drivers can get me close to the neighborhood I live in from anywhere in the city. When I arrived in Istanbul in August, I was told that this building complex would house offices, a hotel, residences, an upscale designer mall, top restaurants, a performing arts theater and cinema. It has looked finished from the outside for the past few months, but, at night, while passing by in taxi, I’ve seen workers feverishly constructing on the interior. It looked marvelous!—and it is! 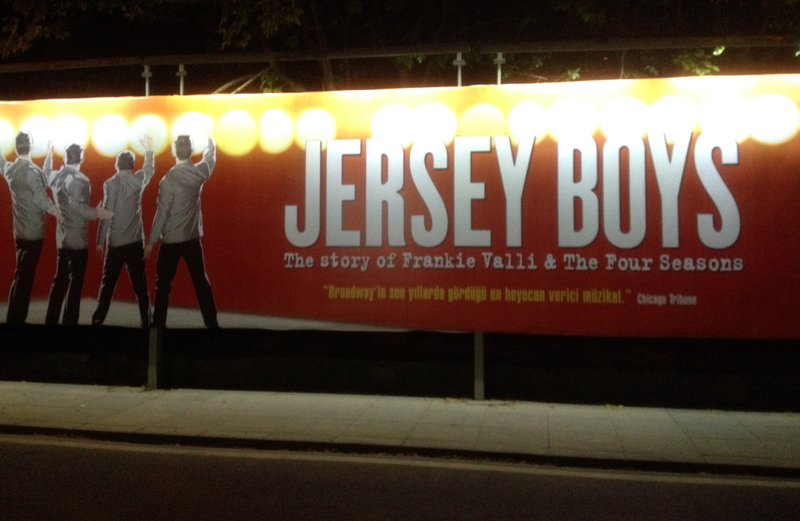 The Zorlu Center opened about a month ago and soon after, a friend at school organized a group event, for those interested, to see The Jersey Boys, the story of Frankie Valli and the Four Seasons. This is one of the first productions to be performed on this new stage. Of course I bought a ticket! Who could resist? 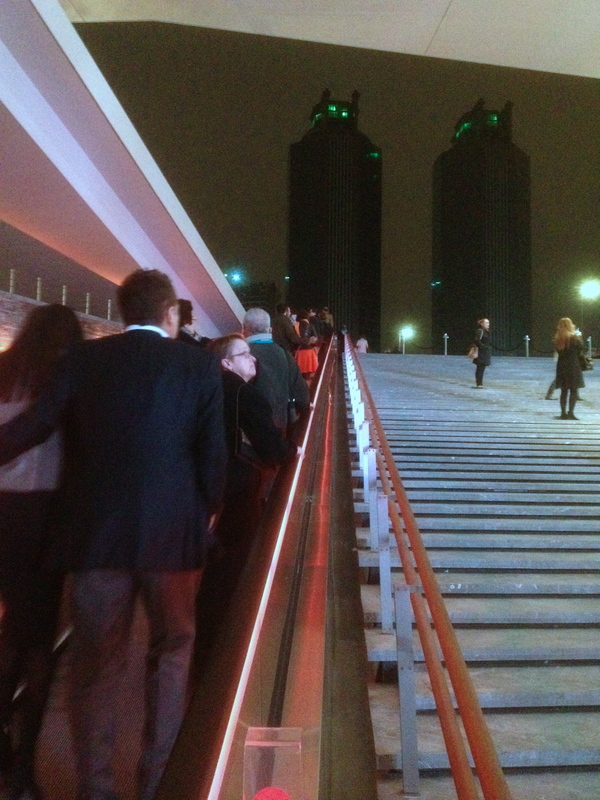 As the event date approached, several of us decided to make a night of it and dine at the new Jamie Oliver restaurant, located in the Zorlu Center! I’m not much of a cook, but I’d heard of the famous British chef from one of my friends in the UK. Chef Jamie is not only known from TV shows and cookbooks, he has been a voice in the campaign against the use of processed foods in national schools. He is most interested in improving unhealthy diets in the UK and the USA and he made a believer out of me last night! The food was DELICIOUS and so beautifully prepared! As a vegetarian, I’ve not had the best of luck in menu selections here in the city, but that is not the case at this eatery. The atmosphere was trendy casual, not stuffy formal. Afterwards, we made our way to Gloria Jean’s for a coffee and then on to the show! I didn’t realize all the songs that the Four Seasons made famous! The entire night we were chair dancing and singing along. In some ways, it made me wish for home, as I watched the life stories unfold of these young men, from poor backgrounds, who became successes. Their stories are like many people who find riches and fame; poor choices can ruin a life that has so much potential. The songs were stuck in my head all night. Big Girls Don’t Cry, Sherry, Oh, What A Night, My Eyes Adored You, Can’t Take My Eyes Off of You, Working My Way Back To You and Rag Doll to name a few. I typically wander the ancient streets and neighborhoods of Istanbul. This experience showed an affluent and contemporary side of Istanbul. East meets West; Old meets New. Istanbul has the best of both worlds. Good. GOLLY. Now I’ve got a strong hankering for the “Plank.” Wow! What a treat. Your photographs are beautiful. Because of the lighting, it is sometimes difficult to take indoor shots of food and restaurants. But you succeeded! I especially love the crowd shot. Jamie Oliver and the Four Seasons. I’m also a big time fan of both. What fun! T.
Hi, T! I’m so sorry…I don’t think I ever responded to you. Thank you so much for your delightful compliments. Coming from you, one of the very best photographers, I’m humbled. Just wait…writing a blog on the Grand Bazaar! Come over and let’s go eat at Jamie’s! Adding it to my list! Again, lovely shots. You have a great eye, Anita! T.
Istanbul and Muscat are similar in that way–a vibrant local culture with some global overtones (Muscat’s Royal Opera House is the epitome–an exquisite building and top acts). I’m surprised you’re having trouble eating well as a vegetarian. Turkey grows wonderful produce and has one of the richest cuisines in the world, and it was easy to eat vegetarian on my first trip there. Hey, Maggie! Great to hear from you. You said it! A vibrant local culture with TONS of global overtones. I would love to see the Muscat Royal Opera House. A friend I’ve made here has lived in Doha for the past 8 years and I am dying to go with her there to see all the fabulous architecture!! No, allow me to explain my “vegetarian statement”. I am NOT having any trouble, locally, eating as a vegetarian. None. It is fabulous! HOWEVER…without exception, the super “nice” restaurants I’ve been to only have sparse offerings on the menu for non-meat eaters. It appears that the “high dollar” joints cater to a meat eating crowd. I don’t typically eat out at these kinds of places. I prefer going to locally owned cafes and stretching my dollar. But at Jamie’s, there were many, many vegetarian options on the menu. Yea!!! I’m ready for Jamie Oliver! What did you have that was so wonderful? Hi, Jimmie! Well, first of all, all the food is organic and carefully grown and managed. I had a wonderful salad, an order of some weird kind of french fry thing and we split an entree of truffle risotto (AMAZING), but my FAVORITE thing was “The Plank”. They bring out this plank of lumber and set it on two big canned tomato cans (so it is raised off the table) and on the plank were four different mezas/appetizers. Wonderful grilled veggies with olives, these tortilla-type chip things with cheese and a dot of something (?) on it, mozzarella balls in olive oil and this other thing that looked like a square of some kind of crust with some kind of nut, cinnamon, veggie mush on it. The Plank is shown in one of the blog photos.